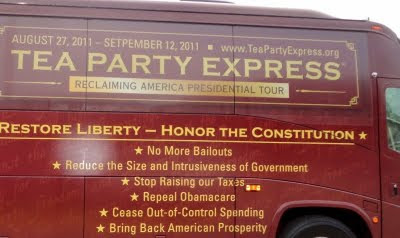 The Midnight Review: Tea Party Bus To Travel Until "Setpember"
Here is another treat - the Tea Party Express seems to have a hard time spelling the month of September. This is particularly funny since they typically evoke September 11th whenever they can! Granted this may be the error of the printer but you would think somebody would have caught this before it went on the bus, like when the printer sends back the proofs of the graphic for the customer to sign off of. No, the elites have just been spelling it incorrectly all these many years! Since the star points on the bus are all things that will actually HURT this nation or flay out misconceptions, it only makes sense that they aren't sure when this tour will end. 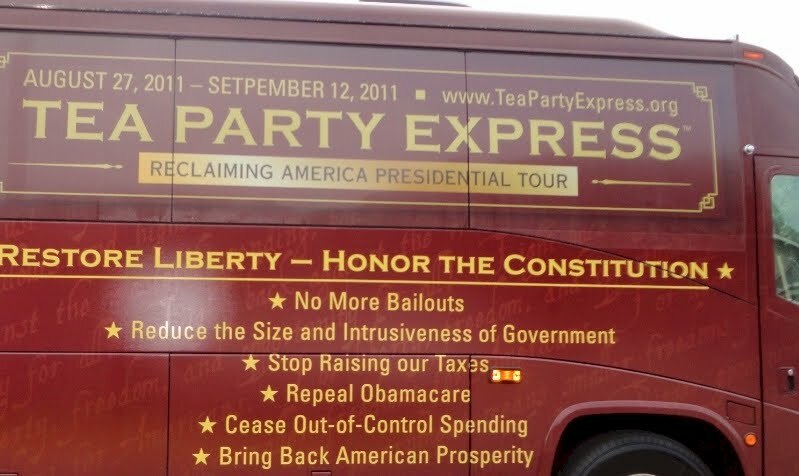 Maybe the big red bus will meet up with Palin's big bust, er bus on some highway and they can spawn lots of little busses that have slogans like "stop Obama, the Muslim," and "let's tie up OBama with impeachmeat," and "Americans for America:no Muslims, blacks, hispanics, poor, elderly or gun-haters allowed."